Bishop Gabriel Yemba Unda (right) gives a Bible to a United Methodist pastor in Kindu, Congo, as part of the church’s Bikes and Bibles ministry to help pastors make disciples in inaccessible areas. Photo by Judith Osongo Yanga, UMNS. The size of the East Congo Episcopal Area and the inaccessibility and state of certain roads has made deep evangelization difficult. 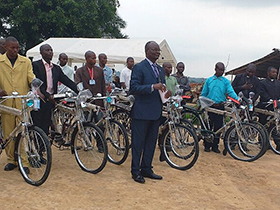 However, The United Methodist Church’s Bikes and Bibles ministry is helping East Congo leaders overcome those obstacles so that they can fulfill their mission of making disciples of Jesus Christ all over the world, said Bishop Gabriel Yemba Unda. “Let’s lift ourselves and build our vision. The bikes and motorcycles that you receive from our partners are means available to help us reach our priority and realize or materialize our vision that is drawn from the book of Nehemiah 2:18,” Unda said. Since 2014, the Bikes and Bibles ministry has been providing bicycles, motorbikes and native-language Bibles to pastors in the United Methodist connection, especially those in Africa. The Rev. Diowo Floribert Mulamba, district superintendent from the Kindu North District, said 95 percent of district churches are inaccessible by vehicle and there are some places inaccessible even by motorcycle. Bishop Gabriel Yemba Unda (center) presides over a service of blessing for new bicycles to be used for evangelism in remote areas of the East Congo Episcopal Area. Photo by Judith Osongo Yanga, UMNS. “With the bike I received, I managed to do my supervision better in the whole district without difficulty,” he said. The Rev. Lohembe Omengonga Rene, pastor of Diefu United Methodist Church in the Tunda District, which is more than 260 kilometers (about 160 miles) from Kindu, said the Bikes and Bibles program is a strong weapon for evangelism. “Today, I come from more than 50 kilometers from my local church to participate in the evangelistic campaign. Thanks to this Bikes and Bibles (program), I reach all the faithful by regular visits from village to village from where I pray that the donors be blessed,” he said. The Rev. Henry Botuli IV, district superintendent of the Ikela District, the furthest district in the Equator and Oriental Conference, said the bikes allowed him to get delegates to this year’s annual conference in Kisangani. “Thanks to the bikes for some pastors and my motorbike, we easily transported two to (a bike) to attend the annual conference, all this to even increase our participation rate by the clergy delegates,” he said. The Rev. Albert Dungu Longombe, director of connectional ministries for the Equator and Oriental Conference, said his bicycle also has helped him share the news of the church. “I went to all seven districts of the conference with more than 2,500 kilometers (about 1,550 miles) round trip to follow the implementation of the resolutions of the annual conference thanks to this bike,” he said. Osongo Yanga is the director of communications for the East Congo Episcopal Area of The United Methodist Church. News media contact: Vicki Brown at (615) 742-5470 or newsdesk@umcom.org. To read more United Methodist news, subscribe to the free Daily or Weekly Digests. The junior block at Hartzell High School, a United Methodist school at Old Mutare Mission in Zimbabwe, housed classrooms for hundreds of students. UMCOR-funded program provides chicks to help women and girls generate income in an area struggling with drought, dying crops. United Methodist offer physical and emotional support as relief efforts continue in hard-hit areas.